How many times have you heard people complain about not having a garden because they don't have the space at home? Hey, lack of space should never stop you from trying to build a garden of your own. A skilled green thumb can turn even the smallest of spaces into a wonderful mini Eden -- be it a single wall vine or a pair of terrariums on the sala center table. 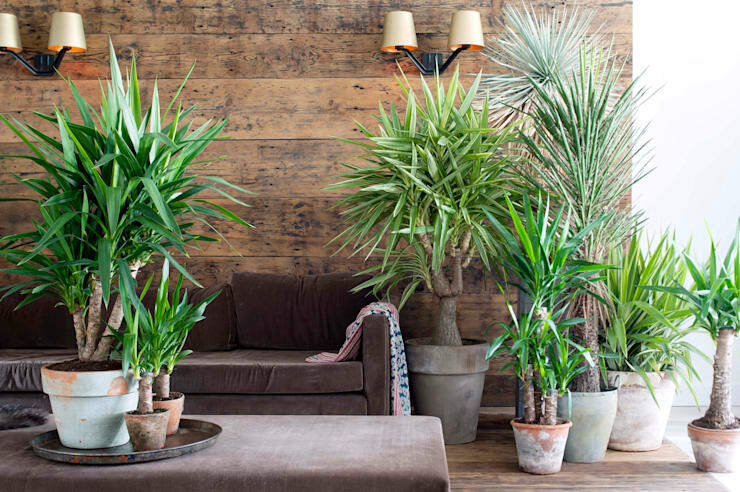 Here are 20 ideas for your small indoor garden to naturally spruce up your space, improve the air quality of your interiors and help you build that mini-Eden inside your home. Soon, you'll have a quiet, green nook where you can relax, rejuvenate and think with a clear mind. ​1. Take advantage of the space below the stairs. - CALATHEA: This plant has leaves stamped in yellow, white and pink, which makes it a welcome fit not just 'neath the steps but in any room of the house. 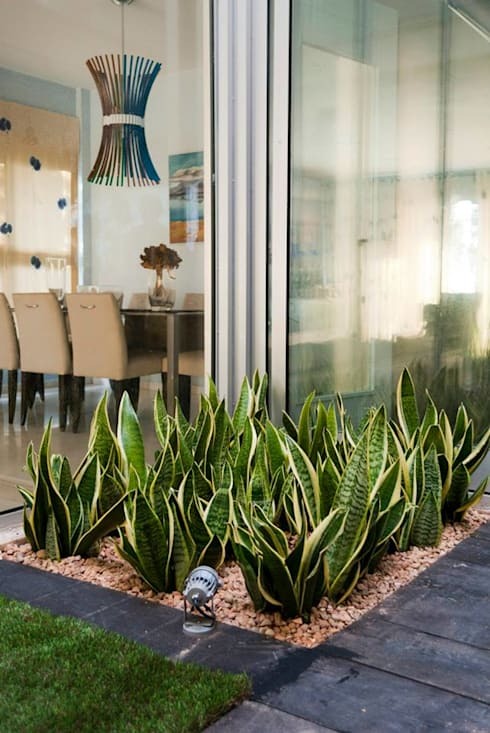 - DIEFFENBACHIA: Use a curtain or a skylight as a barrier between the sun and this plant (especially during summer) because this one needs filtered light. - SANSEVIERIA (Language of mother-in-law): An evergreen that has tolerance for darkness but needs lots of water. It could grow from 2-3 feet, making it a perfect fit under the stairs. 2. Go big, front and center. We totally love this idea! Build a table around a tree planted in a pot and surround it with chairs or benches plus throw in some cushion and throw pillows, et voila! You have a unique dining room that would get guests talking, raving and envying. 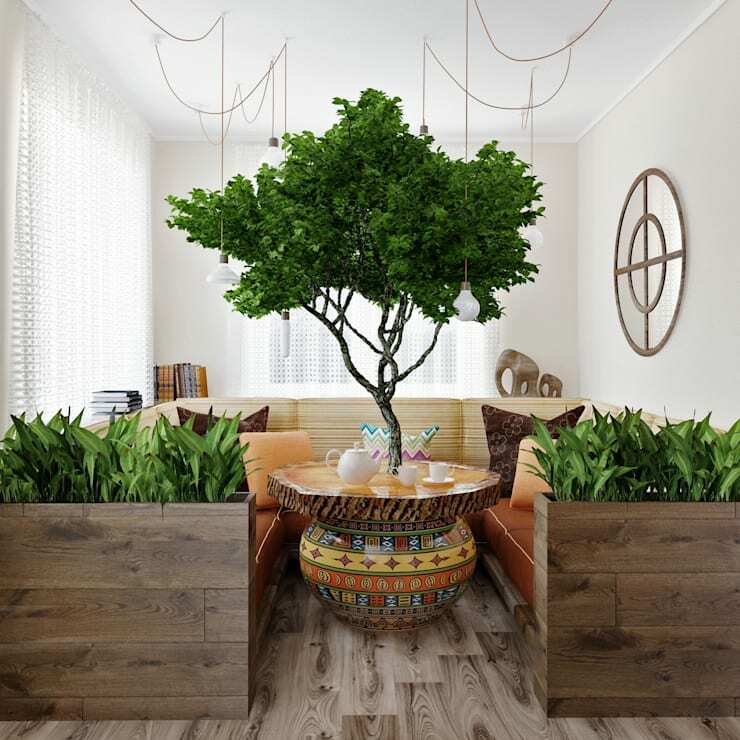 Your tree-centric dining space will be a source of inspiration. Add a few pots and you can hold a garden tea party even when it''s raining outdoors. ​3. Create a hanging wall. 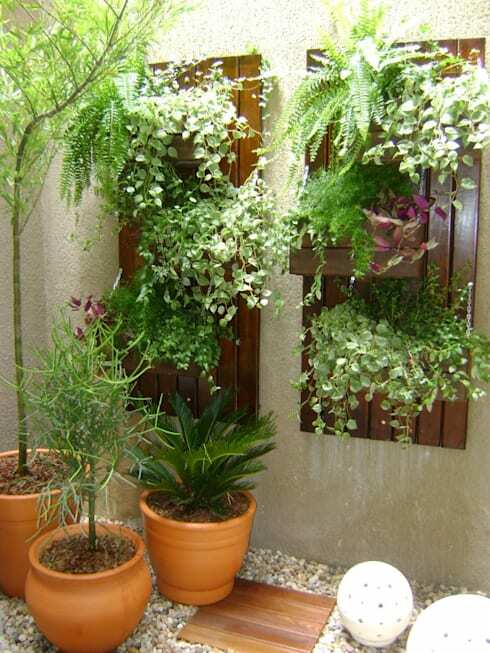 This mini wall garden can be hanged anywhere outside your home, depending on the weather condition and accessible irrigation. By combining plants and flowers of different sizes, colors and textures, in vases and pots, you can crate a vertical landscape that will give harmonious cascades to any restricted outdoor space. 4. Make use of a green corridor. 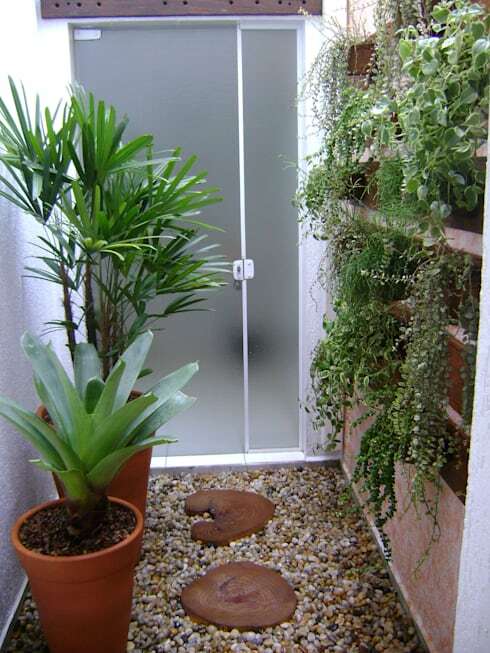 If you have a short, narrow corridor, then turn it into a green garden carpeted by pebbles. 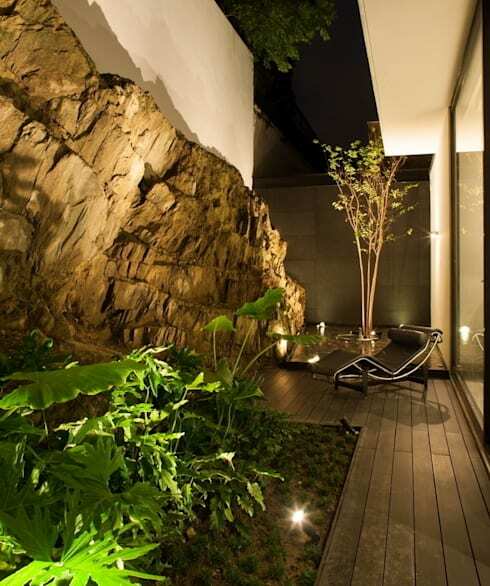 A green wall, pots and stones, and a wood path will literally give life to this formerly benign space. 5. Install a porch garden. Limited space doesn't mean you cannot have a special corner at home where you can just sit back and relax. 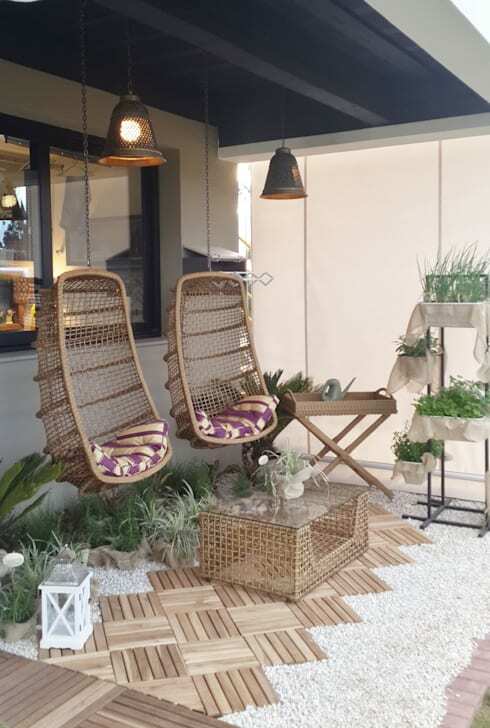 If you have a porch or a veranda, then we suggest installing rattan hanging chairs. It's fun and doesn't take up too much space. Use the wicker as inspiration to accessorize the space with wood elements and small plants. Some houses have strange floor plans that feature cramped, odd-shaped rooms or corners that don't seem to serve any function. In this restricted corner, plants immediately turned it into a visually interesting indoor garden. 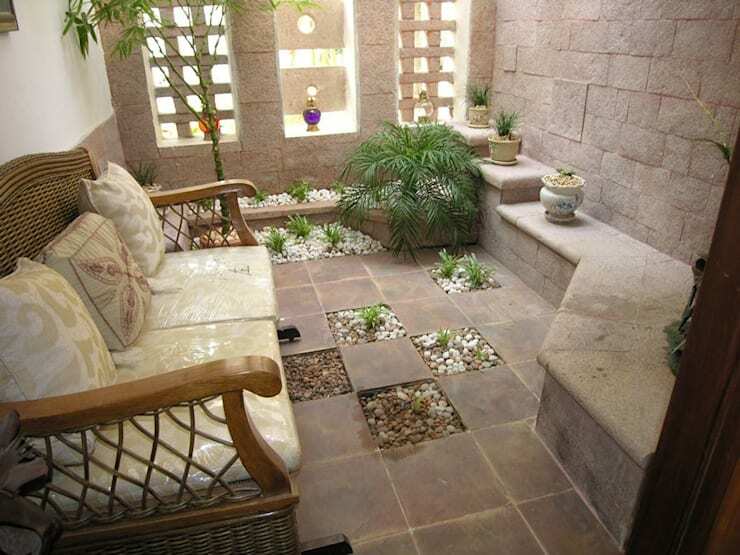 The built-in bench can be used as additional seating area, a display for succulents in ceramic pots or both. 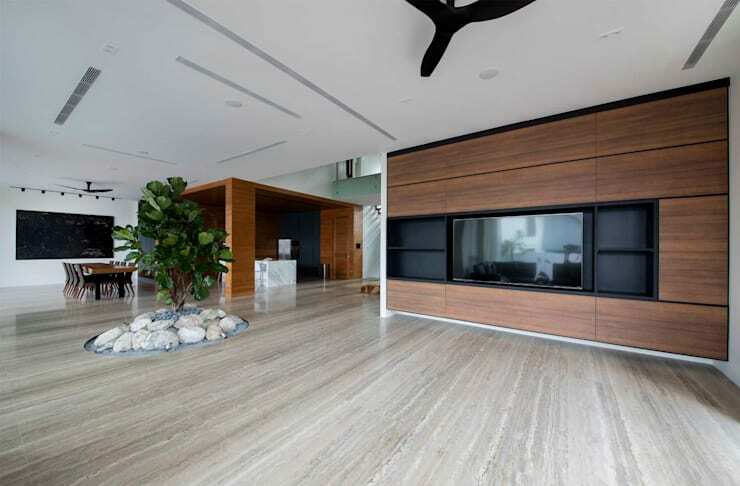 We also love how the owners replaced the floor tiles with pebbles and decorative weeds. ​7. Convert a single big tile into a garden. Don't give up hope if all you have at home are polished tile flooring and no spare soil even for just the littlest of gardens. In this photo, homeowners transformed this big square tile patch in the center of a room into a mini rock garden of succulents, bonsai, mixed foliage, and a bamboo shot decor piece atop a carpet of yellow and white pebbles. 8. Enjoy a night patio. Put your patio in a sophisticated light (pun intended) with wooden board flooring and a rough stone fencing with strategic ambient lighting to create a natural and romantic ambiance. Since most patios receive very little sunlight, choose plants that have high shade tolerance. We also suggest air purifiers like the yellow palm or a Ficus tree. 9. (Mini) farm a single plant type. If you don't have the time or energy to maintain many plants with different needs, then opt for a miniature leafy plot in a small corner at home. All you need is some dirt and river stones. And a single type of brightly colored air purifier like mother tongue. If the chosen corner isn't sunlight-friendly, install yellow spotlights to assist the plants' growth. ​10. Don't hold back on the numbers. Move the beauty of the outdoors inside by filling the laundry room, the bathroom, the living room and any other room in the house with hundreds of small pots of plants in all shapes and sizes. Styled creatively, you can turn your home into a lush conservatory. 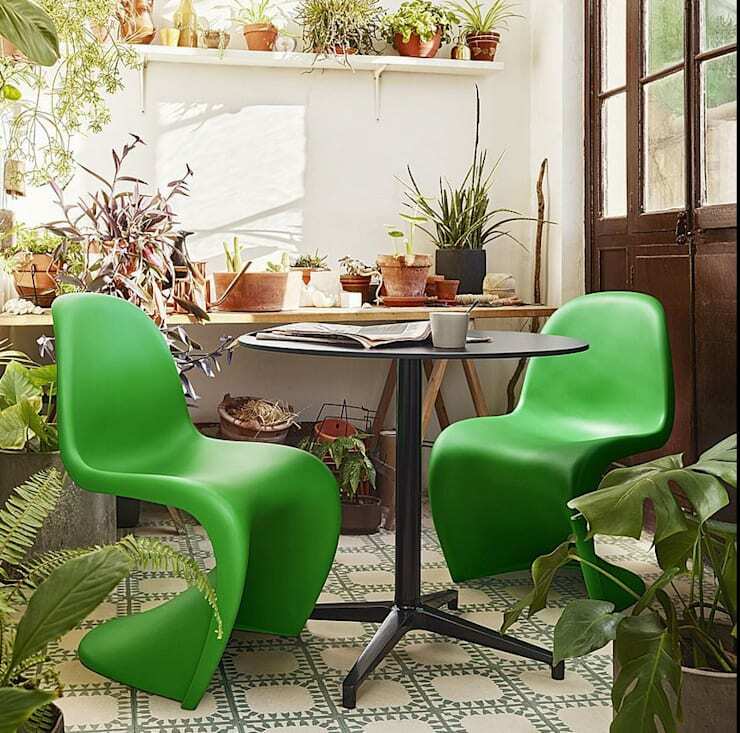 Complement the whole concept with green or wood furniture. 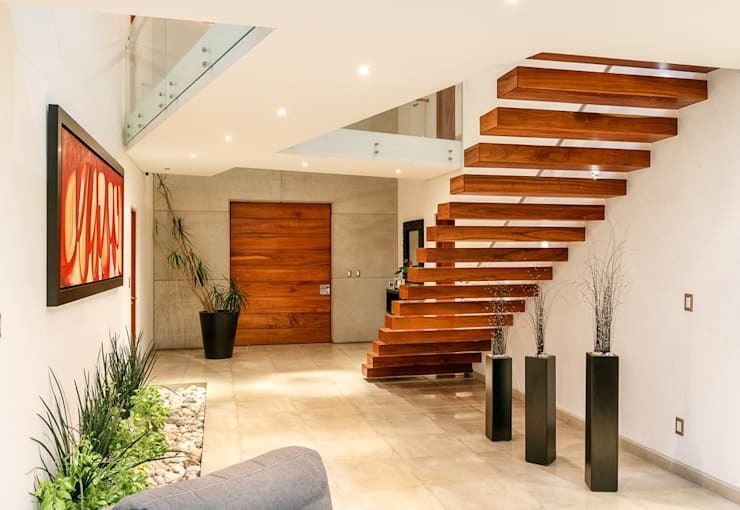 Break away from the stressful monotony of city life as soon as you open your front door and introduce a summer resort feel to your home with tropical palms and some bamboo. Consult with a professional on which tropical variety will survive the most with minimal light, irrigation and maintenance. 12. Purify your home with a lush wall. In addition to promoting tranquility, one of the greatest benefits of indoor gardening is air purification. 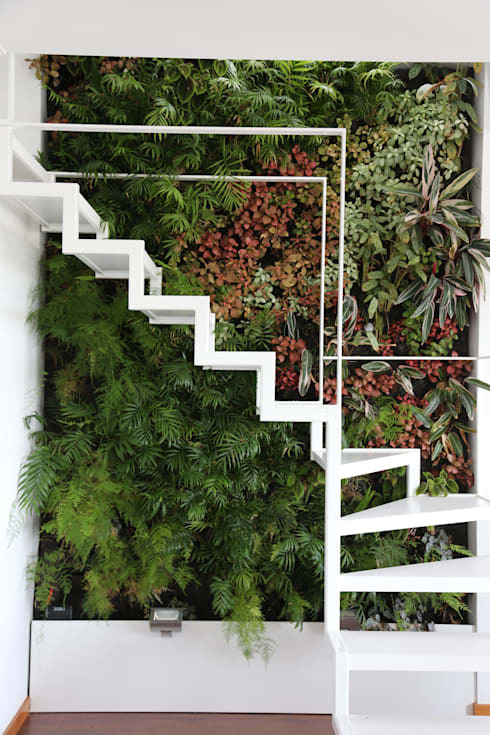 A full green wall or vertical garden injects your home with a healthy dose of foliage without stealing important space. It's also fabulous to look at, isn't it? Bear in mind, tho, that green walls can be difficult to install and maintain so don't be afraid to get help from our experts. ​13. Opt for a simplicity. 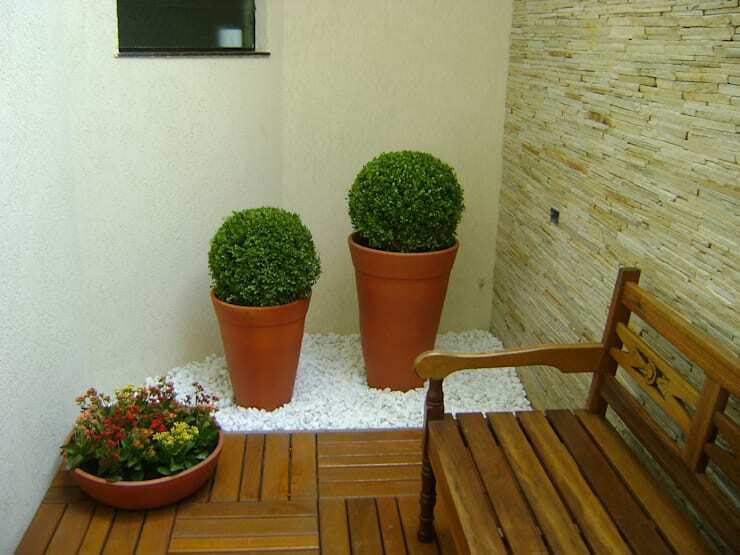 With only two or three pots, enough white stones and a comfy wooden bench, you can already come in direct contact with nature behind closed doors. 14. Hang rustic, ornamental plant holders. 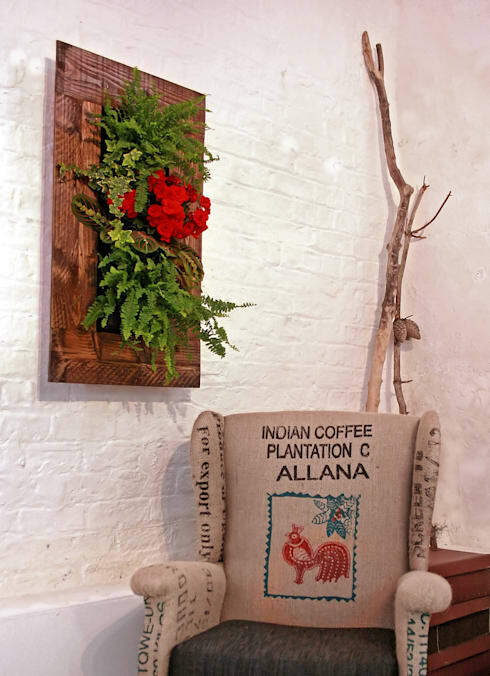 If a full lush green wall or a vertical garden seems too much work, then just hang a plant or two on your wall. It brightens up the surface in a flash. 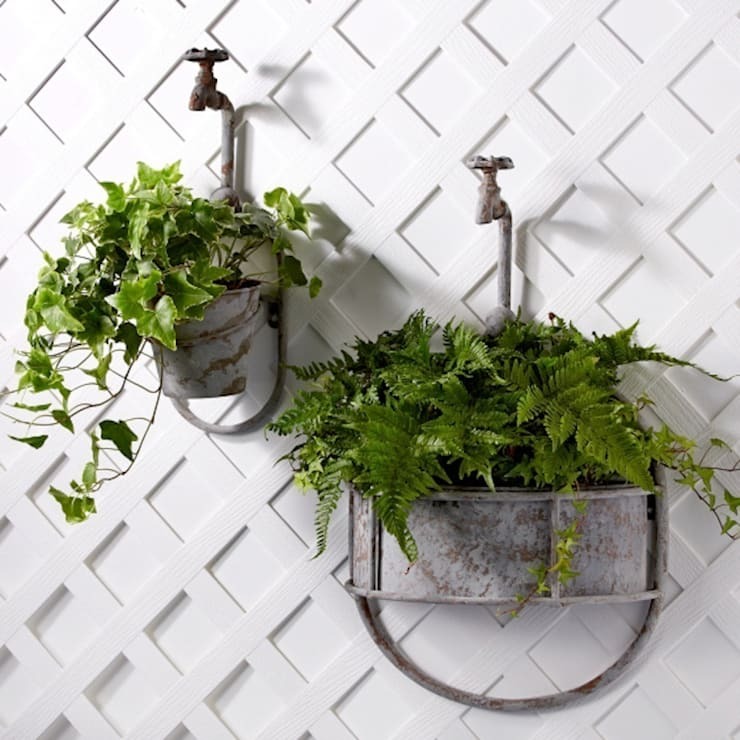 Try a less conventional style like these rustic steel pots that also double as a wall ornament. 15. Select local plants for free-fuss gardening. Local weather should be a major consideration when planning your indoor garden. Palms and ficus are reasonably easy to maintain. Aloe vera, cradles of moses, calas and gannets, lilies and lilies, Ixora, Peperomia, Syngomium, and elephant ears are also a breeze to care for and have great aesthetic value. Almost all fern species can withstand constant exposure to moisture. For desert climates (or room temps), cactus and succulents are top picks. Orchids love moisture, but they also need plenty of natural light. Lastly, remember that bonsai should not be kept indoors for continuous periods of time. 16. 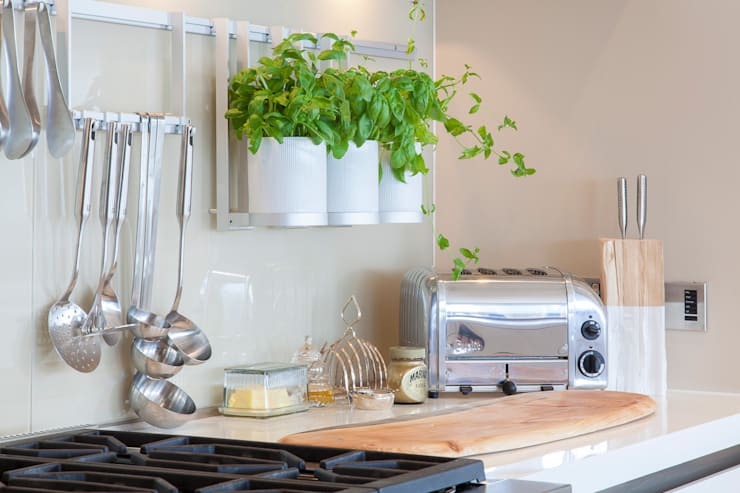 Use fresh herbs in your kitchen. Decorative plants are great and all, but don't forget you also have interesting culinary options. Fresh herbs in tiny cute pots can enhance whatever you're cooking. Hanging 'em in your kitchen won't only fill your cooking space with delicious aromas, but also makes them accessible come mealtimes. Thyme, rosemary, basil and lavender are easy to grow and make for a rich accent on your dinner plates. ​17. Get creative with a green frame. So you want something even easier to maintain than hanging pots? Then go for DIY flower frame. It doesn't have to be big to be a point of interest. Actually, the smaller, the easier it will be to manage. Plant your flower of choice in a mesh, frame it in wood and hang it in the coziest corner at home.This three-dimensional live art piece will not damage your wall at all, as long as it has back protection and is watered with a sprinkler. Admit it, you want this. 18. DIY with low-maintenance terrariums. Terrariums are basically mini gardens in clear, glass containers that require very, very, very low maintenance. It's a creative way to add just a little touch of greenery to small spaces like the dining room table, coffee tables and shelves. 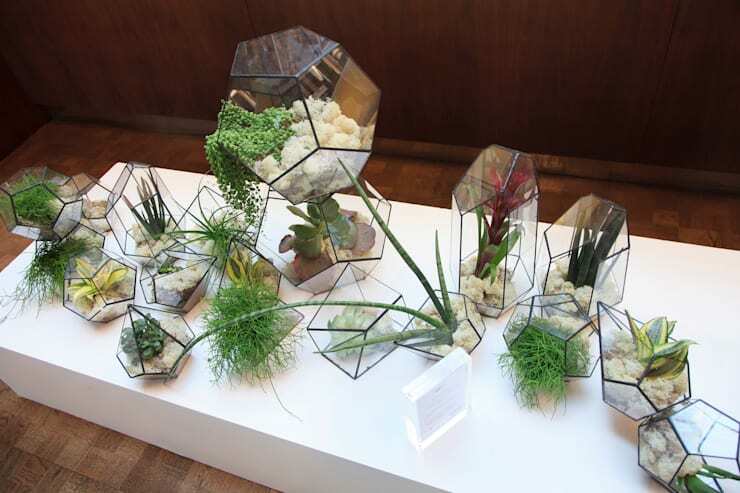 Terrariums come in a variety of shapes and sizes -- spherical, cubic and triangular -- that ooze modern minimalist, so they mix easily with any type of interior design. A major buzzword in indoor gardening these days, they've inspired a lot of DIY gardening projects that even your youngest family member can do. 19. Garden in the bathroom? This beautiful little indoor garden will allow you to enjoy the aesthetic of a natural landscape while you refresh yourself in the bathroom. Imagine getting out of bed in the morning to brush your teeth and be greeted by this beautiful image. You can also watch the rain watering the plants while you take a shower. Since the garden is partially roofed, it will create a current of air that will ventilate the space and keep it cool in hot seasons. In winter you can enjoy the sun you enter. Having vegetation and flowers in general, improves our psychological functioning and our well-being. 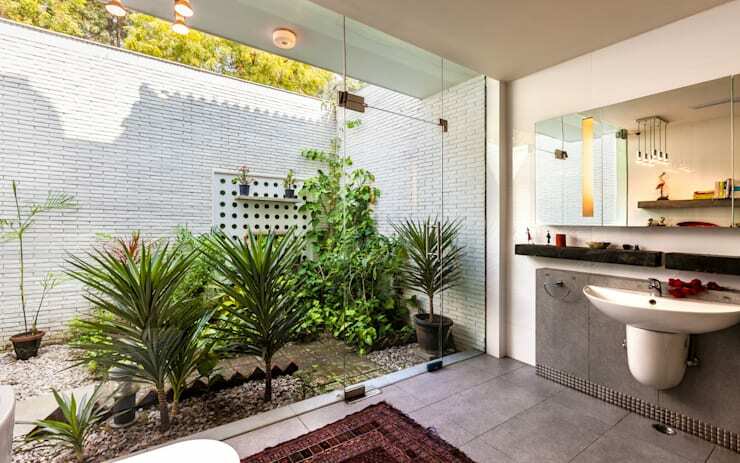 If you are the type of person who finds inspiration in the showerhead, then this inner garden will do even more to relax and let creativity flow. 20. 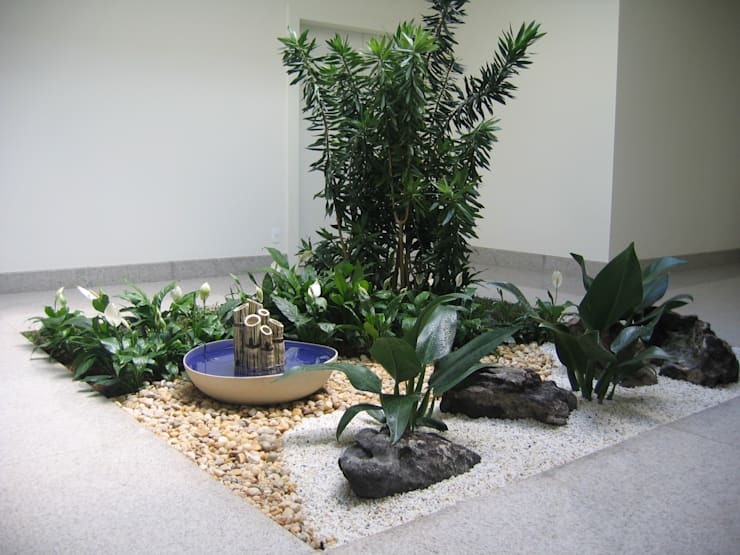 Dare to build an indoor Zen garden. 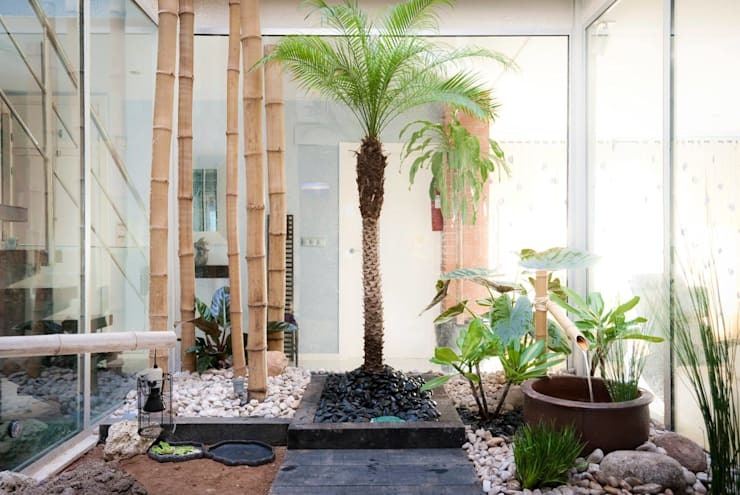 In this picture, a house in Singapore bravely integrated an indoor plant smack in the center of the house to create a small Zen garden. Rocks served both as bed and enclosure while the lone short tree worked wonderfully as a bold contrast to the sepia interiors. Which garden is your favorite? Hit us with your comments below!